Boldly Chic Events: Breakfast for Dinner? 1. Cereal Station - complete with beautiful clear glass vintage bowls, vintage spoons, glass pitchers of milk, and all the "great" cereals (Frosted Flakes, Life, Lucky Charms...the list goes on!). 2. 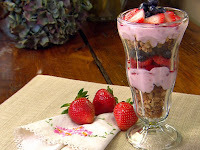 Parfait Perfection - fresh fruit and yogurt served in Sundae Tulip glasses, topped with granola. 3. Rice Krispie Treat Wedding Cake!!!!! Now, I know it won't spark the taste buds of everyone on the guest list - but it sure does have a "wow" factor! Even so, be inspired to switch things up and think outside of the box for your next soiree. The menu is one area where a little twist will put a mark on everyone's memory!